On June 6 1991, the live music video for Holiday taken from the film Truth Or Dare premiered on MTV. On April 15 1991, Madonna and Michael Jackson were featured on the cover of People magazine as The Oddest Couple. It may have been just a one-night stand, but when Pop’s Billion Dollar Boy and the Queen of Steam strutted their stuff at the Oscars, they were, for one brief moment, the brightest star couple of all. As anyone burdened with stardom knows, finding a date for the Oscars can be an enormo pain. After all, really famous folk simply can’t be seen with some sweet nobody who waves “Hi Mom” at the camera and spends the evening worrying about credit-card approval at Spago. And so it was, when Madonna and Michael Jackson, Earth’s top pop stars, faced the who-is-famous-enough-to-be-seen-with-me quandary, they hit on the perfect solution. Since they were already planning a duet for Michael’s upcoming album, Dangerous, and since they both happened to be on all Hollywood’s collagen-enhanced lips anyway—he for his ballyhooed “billion-dollar” contract with Sony, she for her upcoming, already controversial self-ploitation film, Truth or Dare-why not date…each other? Big dates can also become big disasters, however. So a week before the Oscars, the couple met at L.A.’s Ivy restaurant to plan and, perhaps, trade makeup tips. By Oscar night, all was ready. Michael looked positively legendary in gold-tipped cowboy boots, a blinding diamond brooch and—in a dramatic sartorial departure—two gloves. Madonna, awash in peroxide and pluck, diverted at least some of the attention from her low-cut, pearl-encrusted Bob Mackie gown with $20 million in diamonds, on loan from jeweler Harry Winston. They entered L.A.’s Shrine Auditorium and promptly collected their well-deserved Best Seat honors—front row, two on the aisle. On July 10 1991, Madonna appeared on the cover of Australian Smash Hits to promote Truth or Dare. 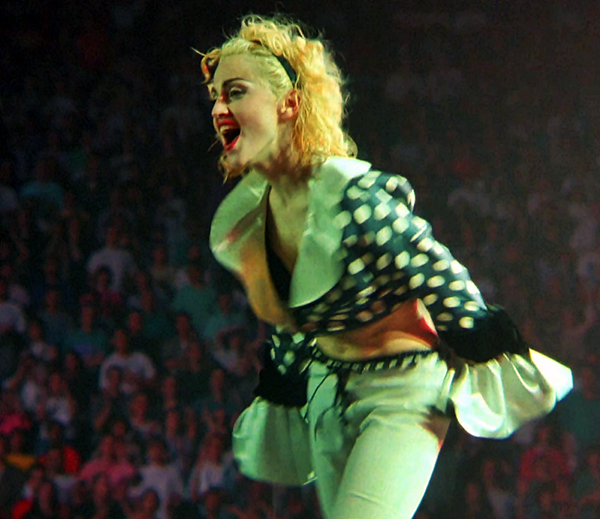 On May 28 1990, Madonna played the second of a three show run at the Skydome in Toronto, Canada during her Blond Ambition Tour. As the story goes, the concert on May 28th was attended by a Toronto police detective who became uncomfortable with Madonna’s simulated sexual theatrics. The detective complained to the Crown attorney, who became convinced–based on how it had been described–that the show on the 29th should not be permitted to proceed with similar content. It took a year before the officer would hear about his cinematic debut in Truth or Dare, when one afternoon his teenage neighbour excitedly shouted across the backyard that he’d spotted him on the big screen.